Beginning in 1995 with the first successful culturing of embryonic stem cells from non-human primates, and later with the isolation of the world’s first human embryonic stem cells in 1998, the University of Wisconsin–Madison has been a leader in the companion fields of stem cell research and regenerative medicine. The research we undertake is making great strides in biomedical science and our ability to treat debilitating diseases, discover new medicines and uncover the fundamental processes that lead to disease. The UW–Madison Stem Cell and Regenerative Medicine Center (SCRMC) operates under the School of Medicine and Public Health and the Office of the Vice Chancellor for Research and Graduate Education. The SCRMC provides a central point of contact, information and facilitation for all stem cell research activities on campus. The center’s mission is to advance the science of stem cell biology and foster breakthroughs in regenerative medicine through faculty interactions, research support and education. 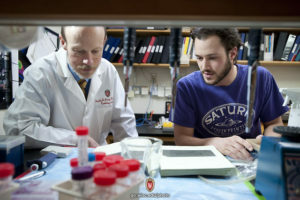 Maintain UW-Madison as leader in stem cell and regenerative medicine research and application. Foster increased stem cell and regenerative medicine communication within campus and beyond its borders. Support stem cell and regenerative medicine research: basic, translational, clinical, bioethics and public policy. Develop educational, training and outreach programs. Enjoy a 2018 University of Wisconsin news article about our center here.